Fibrinolytic therapy has become synonymous with tPA based on the belief that tPA alone was responsible for natural fibrinolysis. Although this assumption was belied from the outset by disappointing clinical results, it persisted, eventually causing fibrinolysis to be discredited and replaced by an endovascular procedure. Since time to reperfusion is the critical determinant of outcome, which in acute myocardial infarction (AMI) means within two hours, a time-consuming hospital procedure is ill-suited as first line treatment. For this purpose, fibrinolysis is better suited. The assumption that tPA is responsible for fibrinolysis is contradicted by published findings. Instead, tPA initiates fibrinolysis which is continued by urokinase plasminogen activator (uPA) which has the dominant effect. tPA and uPA gene deletion and clot lysis studies showed the activators to have complementary functions, requiring both for a full effect at fibrin-specific doses. They are also synergistic in combination thereby requiring much lower doses. A clinical proof of concept study in 101AMI patients was published. Each received a mini IV bolus of tPA followed by a 90 minute infusion of pro-uPA, the native form of uPA. A near doubling of the 24h TIMI-3 infarct artery patency rate compared to tPA was obtained. In further contrast to tPA, there were no reocclusions and the mortality was only 1%. A sequential combination of both activators, mimicking natural fibrinolysis, holds promise to significantly improve the efficacy and safety of therapeutic fibrinolysis. The science historian Thomas Kuhn observed that science tends not to progress as a linear accumulation of new knowledge, but rather undergoes periodic revolutions which he called paradigm shifts . He found that a paradigm shift was required before new findings that challenge a long-accepted concept or established practice are adopted by the scientific community. This observation is particularly relevant to fibrinolysis where a therapeutic regimen based on the premise that tPA was alone responsible for fibrinolysis has resulted in this therapy becoming prematurely discredited and replaced. Primary percutaneous coronary intervention (PCI) is now the treatment of choice for AMI, and other endovascular procedures are being used increasingly in ischemic stroke as well. However, a technically demanding hospital procedure inevitably delays myocardial or brain reperfusion on which the salvage of function and reduction of mortality depend. In non-human primates, the duration of coronary occlusion is the main determinant of myocardial infarct size . In human AMI, when coronary reperfusion takes place within two hours of the event, infarct size measured 2% by scan whereas the figure jumped to 12% one-hour later. After four hours, little further cardiac damage occurred showing that it was already at maximum . Similarly, in a study of primary PCI, it was preprocedural patency (TIMI-3) and not post PCI patency that was the independent predictor of one year survival . In another study, the 6 month mortality in higher risk AMI patients increased from 5% to 13% when reperfusion was delayed from less than two to four or more hours . These findings underscore the importance of prompt reperfusion, preferably within two hours of the event. For most patients, this is readily achievable only with fibrinolytic therapy that can be administered intravenously before catheterization could be done. Unfortunately, current fibrinolytic therapy with tPA is neither sufficiently effective nor safe enough to make this a realistic option. Even when tPA was used as an adjunctive treatment, so-called facilitated PCI, tPA had to be abandoned because it significantly increased the bleeding and rethrombosis complication rate from the procedure . Therefore, a better, safer fibrinolytic regimen is required to make early reperfusion in AMI or ischemic stroke feasible. tPA is a natural activator and the only one isolated from normal human plasma , and was assumed to be responsible for endogenous fibrinolysis. Its properties of high fibrin-affinity and fibrin-dependent plasminogen activation contrasted with the non-specific activators, streptokinase (SK) and two-chain (tc) uPA, available at the time. Therefore, tPA was confidently expected to be both more effective and safer. Surprisingly, three megatrials comparing tPA with SK in a total of 95,740AMI patients [8-10] showed that the death rate with tPA was not significantly lower than that with SK . Moreover, tPA caused significantly more intracranial hemorrhage than SK [9,10]. These results were paradoxical in light of the differences in their fibrinolytic properties, and yet no explanation for the findings was ever offered. Had this occurred, it might have raised questions about whether the assumption that tPA was solely responsible for endogenous fibrinolysis was still tenable. Nonetheless, after these trials tPA was given regulatory approval for AMI, and it remains the fibrinolytic of choice. However, due to tPA's continued disappointing efficacy and intracranial bleeding complications, it has been replaced by PCI as the treatment of choice in AMI, and endovascular procedures are being used increasingly in ischemic stroke as well. Although PCI solved the problem of tPA bleeding complications, a hospital- based procedure inevitably delays reperfusion beyond the optimal two-hour reperfusion window for most patients. For first-line therapy, more rapid reperfusion is needed. The standard tPA dose in AMI is 100mg infused over 90 minutes, giving a plasma concentration of about 3-4|ig/ml . By comparison, the endogenous tPA plasma concentration is 10-12ng/ml, about 1,000-fold less, of which at least half is in an inactive complex with plasminogen activator inhibitor-1 (PAI-1) . Despite this, the natural endogenous system is continuously lysing fibrin. There are two plasminogen activators in blood, the second one being uPA. In contrast to tPA, most of the uPA is carried on the surface of platelets [14,15] and monocytes  rather than being free in the plasma, explaining why it has often eluded detection. The native form of uPA is a single-chain proenzyme, prouPA, which is activated by plasmin to the enzyme, tcuPA. Neither form of uPA has fibrin affinity, in contrast to tPA, but instead there is a uPA cell surface receptor (uPAR) . This allows uPA to induce pericellular plasminogen activation important for cell migration. This important uPA function led to the erroneous conclusion that uPA's activity was limited to the extravascular space . The belief that uPA was not involved in intravascular fibrinolysis persisted  and perpetuated the misunderstanding responsible for the unquestioned use of tPA alone for fibrinolytic therapy. No paradigm shift has yet taken place, which may explain why published evidence that uPA has an important and even dominant function in fibrinolysis has been ignored. For example, tPA and uPA gene knockout studies in mice showed that deleting tPA alone did not diminish endogenous clot lysis much, whereas uPA deletion caused significant inhibition of lysis. When both tPA and uPA genes were deleted, fibrinolysis was essentially arrested , suggesting that tPA and uPA were synergistic in combination. Similarly, uPA but not tPA deletion caused spontaneous fibrin deposition in mice, while deleting both activators induced substantial intravascular fibrin deposition . The more potent effect of uPA over tPA can be attributed at least in part to uPA having two fibrinolytic forms, the single-chain proenzyme and the two-chain enzyme, whereas the single and two-chain forms of tPA have identical fibrinolytic activities . The fibrinolytic activity of tPA also has only a single known fibrin-binding site that is on lysine y-(312-325) of the D-domain of intact fibrin  where it induces activation of a proximally bound plasminogen. The properties of tPA and prouPA and their fibrinolytic functions are complementary , and in combination they are synergistic both in vivo  and in clot lysis studies in vitro . Both activators are, therefore, required for a full fibrinolytic effect at fibrin-specific doses. Fibrinolysis with tPA alone was inevitably going to be inadequate, explaining its history. Unfortunately, since tPA has been equated with fibrinolysis in general, the latter has also become discredited. In the biological system, when an intravascular thrombus forms threatening blood flow, it triggers the release of tPA from the vessel wall where it is stored. The tPA then binds to the thrombus at its binding site  proximal to plasminogen on lysine Aa157 of the fibrin D-domain . This tPA-fibrin-plasminogen ternary complex promotes tPA's activity about 1,000-fold  and initiates fibrin degradation. The remaining unbound tPA is rapidly cleared from plasma (T1/2 ~5 min) and inhibited by plasminogen activator inhibitor-1 (PAI-1). This limits tPA's lytic effect, which is essential for the protection of hemostatic fibrin. Hemostatic fibrin has the same ternary complex tPA and plasminogen binding sites that are on the D-domain of intact fibrin, making it vulnerable to lysis by tPA. Lysis of hemostatic fibrin was found to be the principal cause of bleeding complications during tPA fibrinolytic therapy  (Figure 1). The initiation of fibrin degradation by tPA creates new plasminogen binding sites on fibrin  that are two in number . The first of these is a triple carboxy-terminal lysine binding site on the E-domain of partially degraded fibrin that induces a unique conformational change in plasminogen. Against this conformation, the intrinsic activity of prouPA is promoted about 250-fold enabling it to activate this plasminogen , a reaction that is accompanied by reciprocal activation of prouPA by plasmin . The resultant tcuPA then activates the remaining fibrin-bound plasminogen and completes fibrinolysis. 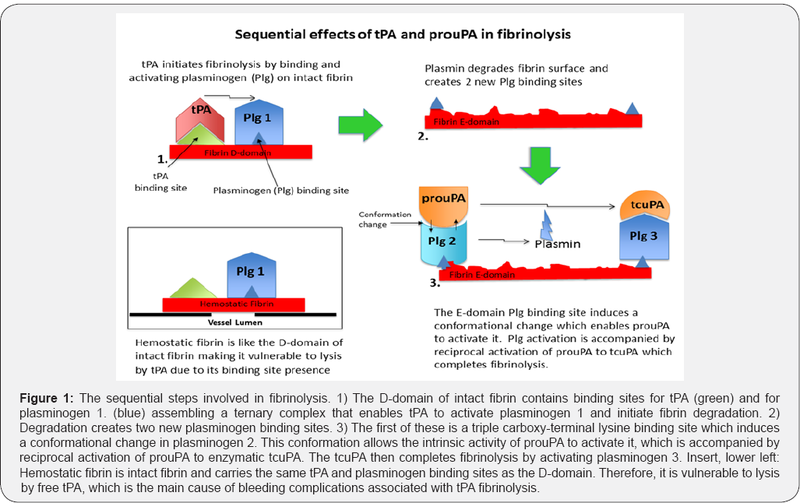 Therefore, tPA activates the first fibrin-bound plasminogen and uPA the remaining two, consistent with its dominant fibrinolytic effect [20,21] (Figure 1). The tPA initiation of plasminogen activation on the fibrin D-domain and that by prouPA on the E-domain was confirmed by studies with these isolated fibrin domains. Plasminogen activation by tPA was promoted only by fibrin fragment-D while that by prouPA was promoted only by partially degraded fibrin fragment-E , consistent with their highly selective and complementary modes of action . As a result, effective lysis at safe, fibrin-specific doses can be achieved only with both activators in combination. When only tPA is used, as in standard fibrinolytic therapy, a high non-specific dose is required for tPA to non-specifically activate the two uPA-specific fibrin-bound plasminogens. At this dose, hemorrhagic complications due to lysis of hemostatic fibrin become a significant risk . Furthermore, since the promoting effect by the synergistic combination is absent, fibrinolysis is also less effective with tPA alone [25,26]. A multicenter clinical trial using the biological regimen of a sequential activator combination was conducted in 101 patients with AMI. A mini-bolus of tPA was administered iv to initiate fibrin degradation, followed by a modest infusion of prouPA. The first 10 patients received a 10mg bolus but this was found to be excessive, so the remaining 91 patients received 5mg of tPA (5% of the standard therapeutic dose) followed by a prouPA infusion of 40mg/h for 90 minutes in all patients. Complete patency (TIMI-3) of the infarct artery at 24h was seen in 82% of the 28 patients that were re-catheterized. No reocclusions or reinfarctions occurred, consistent with the absence of a prothrombotic effect by prouPA, in contrast to that by tPA . The overall study mortality was only 1%, reflecting the high patency rate without reocclusions . These results compared favorably with those of the best of the tPA trials in which the TIMI-3 patency at 24h was only 45% and the mortality was 6.3% . These findings represent a proof of concept of the sequential, complementary, synergistic fibrinolytic mechanisms of action of tPA and uPA and of their clinical potential when used in combination. 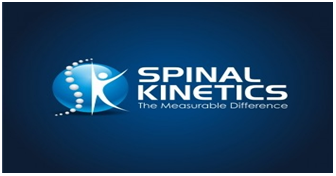 Although the trial was published in a prominent journal, it gained little traction, reflecting Kuhn's observation that a paradigm shift is required before a change in a long-established concept and practice is accepted . Not long after this trial, the development of prouPA by pharma was unfortunately discontinued. Fibrinolysis and fibrinolytic therapy continue to be synonymous with tPA alone, and published evidence to the contrary remains unrecognized. The clinical consequences of this have been significant and costly. A Kuhn paradigm shift is needed and is long overdue. Kuhn TS (1967) Revolutionary view of the history of science: the structure of scientific revolutions. The Physics Teacher, p. 172. Flameng W, Lesaffre E, Vanhaecke J (1990) Determinants of infarct size in non-human primates. Bas Res Cardiol 85(4): 392-403. Brodie BR, Webb J, Cox DA, Qureshi M, Kalynych A, et al. (2007) Impact of time to treatment on myocardial reperfusion and infarct size with primary percutaneous coronary intervention for acute myocardial infarction. Am J Cardiol 99(12): 1680-1686. DeLuca G, Ernst N, Zijlstra F, van 't Hof AW, Hoorntje JC, et al. (2004) Preprocedural TIMI flow and mortality in patients with acute myocardial infarction treated by primary angioplasty. J Am Coll Cardiol 43(8): 1363-1367. Antoniucci D, Valenti R, Migliorini A, Moschi G, Trapani M, et al. (2002) Relation of time to treatment and mortality in patients with acute myocardial infarction undergoing primary coronary angioplasty. Am J Cardiol 89(11): 1248-1252. Stone GW, Gersh BJ (2006) Facilitated angioplasty: paradise lost. Lancet 367(9510): 543-546. Husain SS, Lipinski B, Gurewich V (1981) Rapid purification of high affinity plasminogen activator from human plasma by specific adsorption on fibrin-celite. Proc Nat Acad Sci USA 78(7): 4265-4269. (1990) GISSI-2: A factorial randomised trial of alteplase versus streptokinase and heparin versus no heparin among 12,490 patients with acute myocardial infarction. Lancet 336(8707): 65-71. (1992) ISIS-3: a randomized comparison of streptokinase vs tissue plasminogen activator vs anistreplase and of aspirin plus heparin vs aspirin alone among 41,299 cases of suspected acute myocardial infarction. ISIS-3 (Third International Study of Infarct Survival) collaborative group. Lancet 339(8796): 753-770. GUSTO Investigators (1993) An international randomized trial comparing four thrombolytic strategies for acute myocardial infarction. N Eng J Med 329(10): 673-682. Brophy JM, Joseph L (1995) Placing trials in context using Bayesian analysis. GUSTO revisited by Reverend Bayes. JAMA 273(11): 871-875. Chandler WL, Jascur ML, Henderson PJ (2000) Measurement of different forms of tissue plasminogen activator in plasma. Clin Chem 46(1): 38-46. Baglin TP, Landown R, Frasson R, Huntington JA (2016) Discovery and characterization of an antibody directed against exosite 1 of thrombin. J Thromb Haemos 14(1): 137-142. Vaughan DE, Vautloutle E, Collen D (1990) Urokinase binds to platelets through a specific saturable, low affinity mechanism. Fibrinolysis 4(3): 141-146. Gurewich V, Johnstone M, Loza JP, Pannell R (1993) Pro-urokinase and prekallikrein are both associated with platelets: implications for the intrinsic pathway of fibrinolysis and for therapeutic thrombolysis. FEBS Lett 318(3): 317-321. Grau E, Moroz LA (1989) Fibrinolytic activity of normal human blood monocytes. Thromb Res 53(2): 145-162. Vassalli JD, Baccino D, Belin D (1985) A cellular binding site for the Mr. 55,000 form of the human plasminogen activator, urokinase. J Cell Biol 100(1): 86-92. Collen D (1999) The plasminogen (fibrinolytic) system. Thromb Haemost 82(2): 259-270. Longstaff C, Kolev K (2015) Basic mechanisms and regulation of fibrinolysis. J Thromb Haemost 13(Suppl 1): S98-S105. Singh I, Burnand KG, Collins M, Luttun A, Collen D, et al. (2003) Failure of thrombus to resolve in urokinase-type plasminogen activator gene-knockout mice: rescue by normal bone marrow-derived cells. Circulation 107(6): 869-875. Bugge TH, Flick MJ, Danton MJ, Daugherty CC, Romer J, et al. (1996) Urokinase-type plasminogen activator is effective in fibrin clearance in the absence of its receptor or tissue-type plasminogen activator. Proc Natl Acad Sci USA 93(12): 5899-5904. Rijken DC, Hoylaerts M, Collen D (1982) Fibrinolytic properties of one-chain and two-chain human extrinsic (tissue-type) plasminogen activator. J Biol Chem 257(6): 2920-2925. Medved L, Nieuwenhuizen W (2003) Molecular mechanisms of initiation of fibrinolysis by fibrin. Thromb Haemost 89(3): 409-419. Pannell R, Black J, Gurewich V (1988) The complementary modes of action of tissue plasminogen activator (t-PA) and pro-urokinase (pro- UK) by which their synergistic effect on clot lysis may be explained. J Clin Invest 81(3): 853-859. Collen D, Stassen JM, Stump DC, Verstraete M (1986) Synergism of thrombolytic agents in vivo. Circulation 74(4): 838-842. Gurewich V, Pannell R (1987) Synergism of tissue-type plasminogen activator (t-PA) and single-chain urokinase-type plasminogen activator (scu-PA) on clot lysis in vitro and a mechanism for this effect. Thromb Haemost 57(3): 372-378. Voskuilen M, Vermond A, Veeneman GH, van Boom JH, Klasen EA, et al. (1987) Fibrinogen lysine residue Aa157 plays a crucial role in the fibrin-induced acceleration of plasminogen activation, catalyzed by tissue-type plasminogen activator. J Biol Chem 262(13): 5944-5946. Hoylaerts M, Rijken DC, Lijnen HR, Collen D (1982) Kinetics of the activation of plasminogen by human tissue plasminogen activator. Role of fibrin. J Biol Chem 257(6): 2912-2919. Marder VJ, Sherry S (1988) Thrombolytic therapy: current status. N Engl J Med 318(23): 1512-1520. Harpel PC, Chang TS, Verderber E (1985) Tissue plasminogen activator and urokinase mediate the binding of Glu-plasminogen to plasma fibrin I. Evidence for new binding sites in plasmin-degraded fibrin I. J Biol Chem 260(7): 4432-4440. Suenson E, Lutzen O, Thorsen S (1984) Initial plasmin-degradation of fibrin as the basis of a positive feed-back mechanism in fibrinolysis. Eur J Biochem 140(3): 513-522. Liu J, Gurewich V (1992) Fragment E-2 from fibrin substantially enhances pro-urokinase-induced glu-plasminogen activation. A kinetic study using a plasmin-resistant mutant pro-urokinase (Ala-158-rpro- UK). Biochemistry 31(27): 6311-6317. Petersen LC (1997) Kinetics of reciprocal pro-urokinase/plasminogen activation. Stimulation by a template formed by the urokinase receptor bound to poly (D-lysine). Eur J Biochem 245(2): 316-323. Liu J, Gurewich V (1991) A comparative study of the promotion of tissue plasminogen activator and pro-urokinase-induced plasminogen activation by fragments D and E-2 of fibrin. J Clin Invest 88(6): 20122017. Weaver WD, Hartmann JR, Anderson JL, Reddy PS, Sobolski JC, et al. (1994) New recombinant glycosylated prourokinase for treatment of patients with acute myocardial infarction. Prourokinase Study Group. J Am Coll Cardio 24(5): 1242-1248. Zarich SW, Kowalchuk GJ, Weaver WD, Loscalzo J, Sassower M, et al. (1995) Sequential combination thrombolytic therapy for acute myocardial infarction: results of the pro-urokinase and t-PA enhancement of thrombolysis (PATENT) trial. J Am Coll Cardiol 26(2): 374-379. GUSTO Angiographic Investigators (1993) The effects of tissue plasminogen activator, streptokinase, or both on coronary-artery patency, ventricular function, and survival after acute myocardial infarction. N Engl J Med 329(22): 1615-1622.